Bhubaneswar:26/10/18: Hundreds of Congress activists and leaders staged a demonstration outside CBI office here on Friday, as part of the party’s nationwide protest against the decision of the Centre to send the probe agency’s director, Alok Verma, on leave. 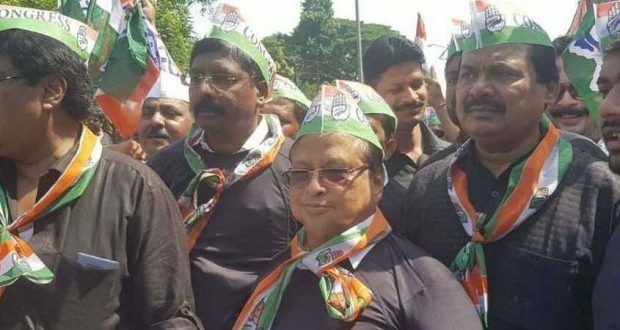 The demonstrators, led by Odisha Pradesh Congress Committee President Niranjan Patnaik, raised slogans against the Centre, alleging that Verma was sent on leave to stall investigation into charges of “corruption” in Rafale jet deal. The Centre on Wednesday divested Verma and special director Rakesh Asthana of their powers and sent the two feuding officials on leave. Verma had reportedly opposed Asthana’s elevation as the special director of the premiere agency on the ground that he was being probed in a graft case. CBI additional director M Nageshwar Rao was appointed as the interim director of the agency. The Congress activists, sporting black T-shirts, attempted to enter into the CBI office here, but were stopped by the security personnel at the gate. Terming the action against Verma as “illegal, unconstitutional and intentional”, Patnaik alleged that people of Odisha, particularly the victims of a multi-crore chitfund scam, have been cheated by Asthana, who was monitoring the CBI probe into the case. Over the past two years, there had been no progress into the chitfund scam probe in Odisha, he said. “The investigation into the scam has been slowed down to shield ruling BJD members, with support from the BJP-led NDA government at the Centre,” he added.